I am a biologist with a special interest in what happiness is about. I am in the fortunate position to pursue that interest as a scientist working for the Norwegian Institute of Public Health. For me, a key question is: How can we organize a society in a way that caters to human well-being and at the same time saves the environment? The intentional community movement attracted my interest several years ago for two reasons. For one, as a scientist I like to perform experiments. While that is relatively straightforward when dealing with mice or rats, humans are difficult. Fortunately, humans are quite keen on doing experiments on themselves. They set up all sorts of strange environments to live in. As a scientist all I need is to harvest information as to how these experiments proceed. 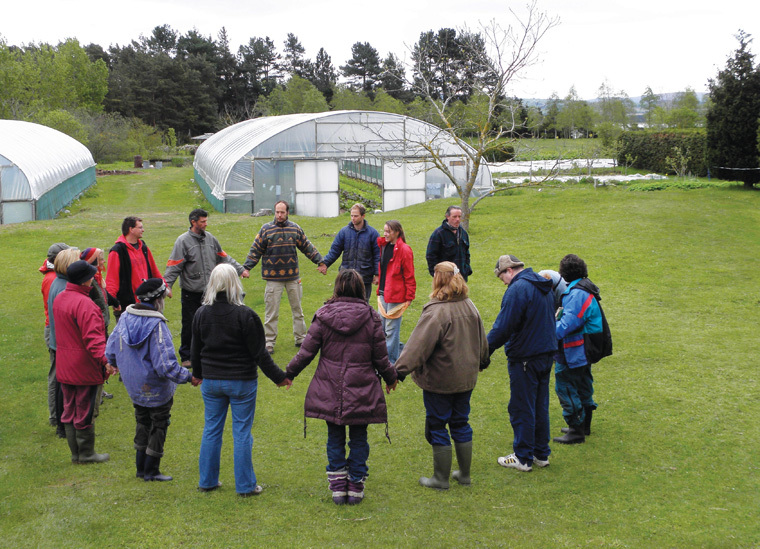 Intentional communities are perfect in this respect as they are located within mainstream society, yet have particular qualities that set them apart. It means the inhabitants start out with the same cultural background, yet choose to live in a way that contrasts with what is typical for industrialized countries. The question is what impact this choice has. My other reason for approaching ICs is that they do, in certain ways, lead us back to the “roots of the human soul.” At least, that is the way I see it. For most of my professional life I have tried to understand how evolution has shaped the human brain—a topic that may be referred to as human behavioral biology. Industrialized society has a severe problem reflected in the statistics of mental disorders and the concomitant reduction in quality of life. As a human behavioral biologist I look for possible causes in whatever is different between the present way of life and the environment that shaped our genetic constitution. The latter can loosely be referred to as Stone Age tribal life. We appear to be in a situation similar to animals living in a deprived setting such as an unsavory zoo. There are elements in ICs that reflect an adaptation to our genes. I do not suggest that we should move back to the Stone Age—there are too many benefits of modern life—but we may take a lesson or two from our past. In order to utilize the potential inherent in the IC movement, I contacted Professor David Sloan Wilson at Binghamton University (upstate New York). Like me, he is a biologist who brings an evolutionary perspective to the question of how to best organize society. He recruited his Ph.D. student, Ian MacDonald; while I recruited a psychologist from my Institute, Ragnhild Bang Nes. Together we formed a team aimed at tackling the required research. With the help of the Fellowship for Intentional Community, and Laird Schaub in particular, we contacted a large number of communities to ask their members to fill in an anonymous questionnaire. The questions probed topics such as life satisfaction, social connectedness, and mental issues. To motivate participation, respondents were entered into a cash lottery draw, with prizes totaling $6000 being awarded to the community the winners represented. In total, over 1000 people responded, spanning 174 communities (primarily in the US). The number of participants was sufficient to do meaningful statistical analyses. We were particularly interested in: 1) How people were coping in intentional communities compared to outside populations; and 2) what communal features correlated with well-being. We hoped the results might help communities improve their organization and philosophy. Moreover, there might also be communal features that can be applied to mainstream society in order to improve life satisfaction. The world is in dire need of finding ways of living that combine a happy life with a reduced ecological footprint. So, how did our scientific musings fare when confronted with real-life persons living in these communities? A key observation was that people in ICs reported to be very happy with their lives. Obviously, happiness is not as easy to probe as weight or body temperature. One accepted measure is based on questions of the type: “I am satisfied with my life”, where people respond on a scale from Strongly disagree (value 1) to Strongly agree (value 7). We used a set of five such questions (based on a strategy developed by the psychologist Ed Diener). The participants scored on average 5.4 (on a scale from 1-7 where 7 is the most happy). This is on par with the best results obtained in any population, and well above the typical response of North Americans. There are some obvious caveats. For one, individuals who choose to live in ICs may be characterized by a more positive sentiment than the average population. Moreover, the subpopulation that filled in the questionnaire may have been further selected in the direction of positive attributes. In fact, we did see that the respondents had a high level of education, and they scored well above the US norms as to desirable psychological traits—such as emotional stability, agreeableness, extroversion, and conscientiousness. Although a selection bias may partly explain both the satisfaction with life and other attractive attributes, there are reasons to believe that the results also reflect an advantage of communal life. This position is supported by the highly positive response to the following two questions: 1) How satisfied are you with your community? ; and 2) How has your life changed since becoming a member? The average scores were respectively 5.9 and 6.1 on the 1–7 scales used. At least most of the participants expressed very strongly that their lives had improved by living in an IC. Moreover, the high scores on Emotional stability and Conscientiousness correlated with the number of years in the community. We went on to examine which features of life in ICs might be responsible for the reported satisfaction with life. Satisfaction had a strong correlation with social support; inhabitants with a high level of supportive friends and associates were happier. The same was true for those who engaged themselves in, and felt oneness with, their communities. These results are not at all surprising. Social connectivity is generally found to be the most prominent predictor of happiness, and the participants scored relatively high on measures of social life. Perhaps slightly more surprising was the observation that the number one predictor of life satisfaction was to have found a meaning in life. Again, the present population scored high on this measure when compared to other studies of US populations. Moreover, those who reported to be searching for a meaning were considerably less happy than those who had found a meaning. Social connections were presumably important for the survival of prehistoric humans. We evolved to live in small-scale, tribal communities (perhaps 20-40 people) with tight connections and considerable engagement in tribal affairs. Some of the benefits we uncovered in our study may be ascribed to ICs offering a somewhat similar setting. The importance of finding meaning in life is less obvious. It may be explained by an evolutionary mechanism installed to spur the individual to do whatever is construed as conducive to the propagation of life (and thus genes). In a hunter-gatherer society, daily activities required for sustenance probably reduced the need for seeking meaning elsewhere. The present focus on meaning, or purpose, may reflect an alienation from the traditional way of life. Daily activities no longer entail the same palpable relevance, thus meaning has to be sought in other spheres of life. ICs are probably better at catering to this need compared to general (industrialized) society. As implied by the term intentional, they gather people under an umbrella of some form of intent. Furthermore, many communities stress the importance of growing, and preparing, their own food. It is important to reduce the ecological footprint made by the average citizen of industrialized countries. We need, in other words, to decrease consumption. The participating communities belonged to three loosely defined categories: 1) ecovillages (focusing on sustainability); 2) cohousing and related initiatives based on practical and/or psychological benefits of communal life; and 3) religious communities (where a shared belief system is the main foundation). Regardless of their main focus, most ICs converge on a lifestyle of less expenditure. Indeed, many respondents in our sample mentioned sustainability concerns as a primary reason for joining their community. Supporting the effectiveness of this position are several existing studies indicating that members of ICs do leave a smaller ecological footprint. It is difficult to sell a low consumerism lifestyle to the general population if it means a reduced quality of life. That, perhaps, is the real beauty of our results. The participating IC members proved that it is possible to combine happiness with a low impact lifestyle. The research was admittedly based on long-standing communities—the respondents had on the average 10 years of tenure. Establishing a flourishing IC requires hard work and considerable perception; but when successful, there are distinct benefits for both members and future generations. The success is apparently due to features that may be manifested, or at least reached for, by both mainstream and alternative societies: a strong social network and a meaningful life. The feasibility of these attributes, even within large cities, is suggested by the fact that many of the participating communities were indeed situated in cities—typically in the form of cohousing ventures. The first scientific paper based on the project has been submitted to a scientific journal, yet our research project is far from finished. There is a lot more data to mine from the questionnaire responses already obtained. We also find the IC movement to be a very interesting venue for further investigations. Hopefully, this research will benefit both the community initiatives and greater society. Bjørn Grinde is educated in biology, anthropology, and psychology. He presently works as a chief scientist at the Division of Mental and Physical Health, Norwegian Institute of Public Health, where he tries to understand how evolution has shaped the human brain (see grinde.wikispaces.com). He has published several books related to this topic, including one that explores alternative ways of living: Improving the Human Zoo (The Darwin Press, 2015). ← How Does Your Community Create Space for Romantic Partnerships?